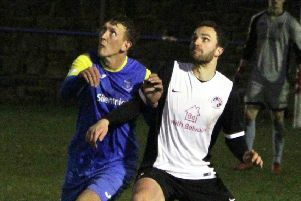 Padiham claimed a resounding 4-0 win over doomed Abbey Hey on Tuesday night to move eight points clear of the drop zone. The Storks’ cushion is also eased with next bottom West Didsbury and Chorlton only having five games remaining to play. Skipper Ben Hoskin put Adam Morning and Michael Morrison’s side ahead three minutes before the break with an emphatic penalty, after Ben Mills was brought down by visiting keeper Ross Heywood – with the referee having already pointed to the spot as the ball was put into the net. Just before the hour mark, Padiham gave themselves some breathing space as a corner was whipped in by Alex Ralph, and Sam Howell got on the end of it to finish. Samuel Howell. Within two minutes, the Storks killed the game off, with Ralph again involved, as his cross was met by B en Mills for his first Padiham goal. Mills was then replaced by Thomas Hulme, who went on to make it 4-0 20 minutes from time, with another clinical finish. The win leaves Padiham 16th in the table, ahead of a tasty derby on Saturday at the Ruby Civil Arena, when Barnoldswick Town are the visitors (kick-off 3 p.m.). Town lie 10th in the table after an impressive campaign to date, but Matt Barnes’ men are currently enduring a run of seven-successive defeats in all competitions.